There can be no doubt dressing up a small child for Halloween in a cute costume is as good as it gets in that area, but coming in right behind them is to dress up your dog in a Halloween costume; and one of the best and funniest ways is to deck them. Porky Pig is a beloved character created by Bob Clampett for Warner Bros. Looney Tunes and Merrie Melodies series. Porky was the first cartoon character created by Warner Bros. to make into a cartoon star of the type which would attract significant..
For those who may not know, Eeyore is the hilarious donkey in the Winnie the Pooh series, who, to say the least, as a pessimistic outlook on daily life, which makes his one liners extremely funny as he looks at almost everything through that gloomy spectrum. what makes Eeyore especially endearing to his fans is the occasional foray into a positive outlook on life. I'm sure that mirrors how a lot of people view life, and so people relate to him as they see a little of themselves in him. Eeyore is a quiet and contemplative character, always seeming to have a bit of a weight on his shoulders as he appears to be thinking of how something will negatively affect him at any time. That relates to many of those that he comes into contact with. Either way, Eeyore does have a soft side to him at times, and all these characteristics, along with his unique look, make him a great choice for a costume to wear at a Halloween party or other costume event. Personally, Eeyore has always been one of my favorite cartoon characters. 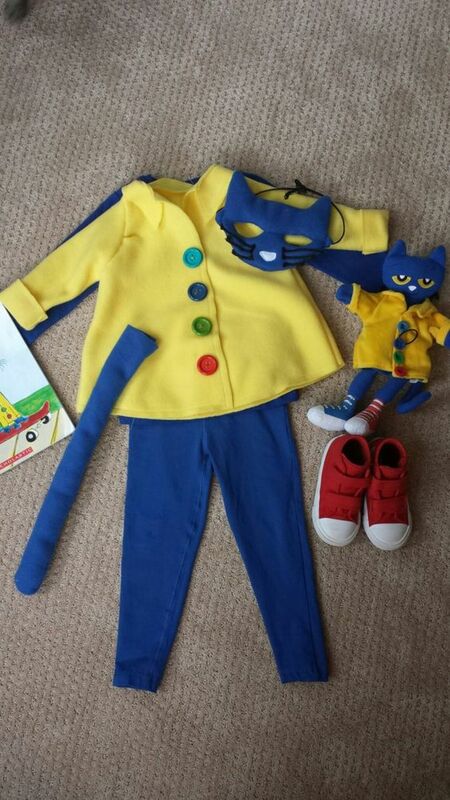 To me, there is nothing more fun than dressing up in a costume as a cartoon character, and then getting a few of the characteristics and sayings of that character memorized or acted out. With Eeyore, it doesn't get much better than that for a costumed character, as you not only can grab some of his gloomy sayings to repeat, but you can make up a few of your own. All you have to do is practice that destitute voice of his to generate a lot of laughs. Add to that the look of the donkey and you can see what it's so fun to don a costume bearing a resemblance to him. What's easy and fun about making an Eeyore costume, or at least partially making one, is focusing on the ears and tails of the interesting character. Having some dropping donkey ears and a long tail looks funny in and of itself, and you can wear something blue and purple as the body of Eeyore to complete the look. Even if you aren't that great at designing a costume, simply having the ears and tail usually suffice to generate a good laugh. 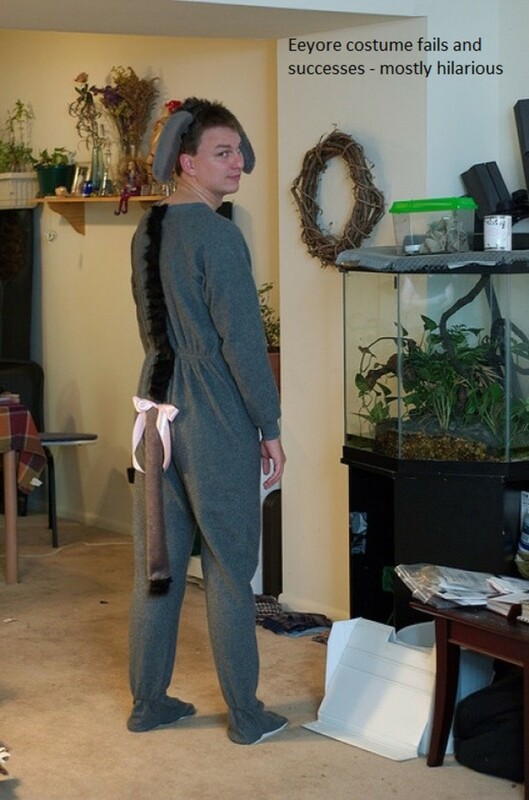 And if you want to, you can always buy a pre-made tail and ears of Eeyore to make it even easier. As for making an Eeyore head, along with the ears, include some material for the nose, and add the black mane of the donkey so people know who it is exactly you're trying to portray. These are relatively easy to make, or you can buy some material that can be hot glued on, as far as the mane goes, and shaped into Eeyore's nose, as far as that part of his look. But for some, just adding the ears and mane can be enough for people to know it's Eeyore. 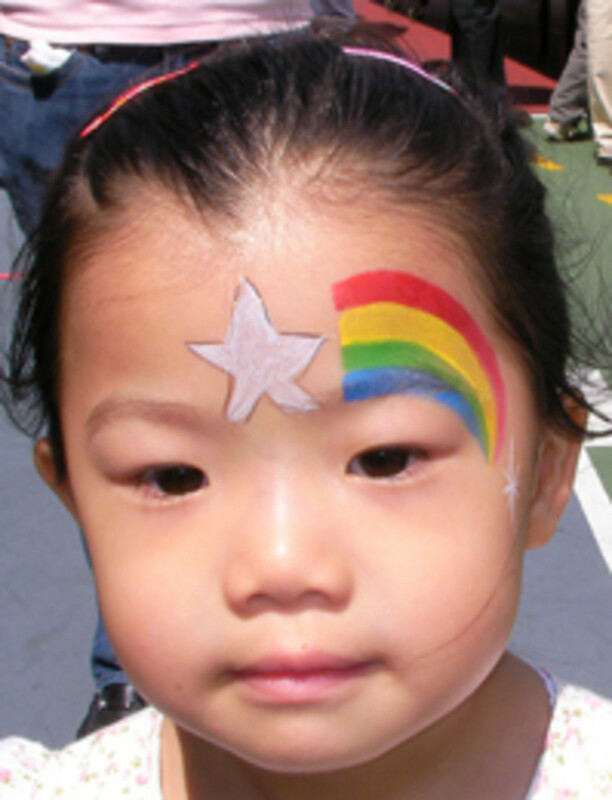 Be sure to include the right colors though, or your work could be in vain. 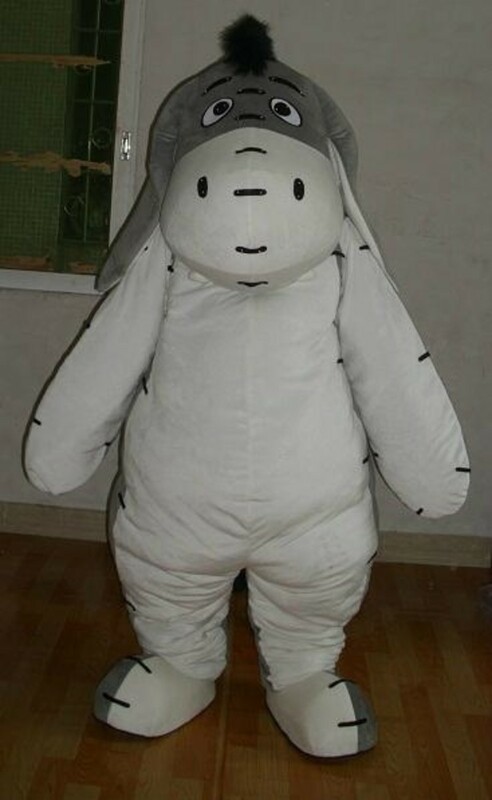 Costumes like the one below are called "mascot" costumes, and this one is a pretty good one of Eeyore, although it's odd that the designer didn't choose to have the actual colors of Eeyore in the costume as all of us know him. It would have been much more compelling, even though it's a pretty cool costume. Notice the ears and eyes. That's the reason I included the costume, as they capture exactly how Eeyore tends to look when he's contemplating life around him. Earlier it was mentioned how easy and interesting it is to make an Eeyore costume if you include the ears and tail as part of it. This costume is a good example of that, and it even has a nice mane going down the back to accentuate the look. Notice how cool the ears of Eeyore look on this costume, and the clothing chosen to wear as the body of Eeyore. It's simple, funny, and is easy to recognize that it's Eeyore that is being portrayed. 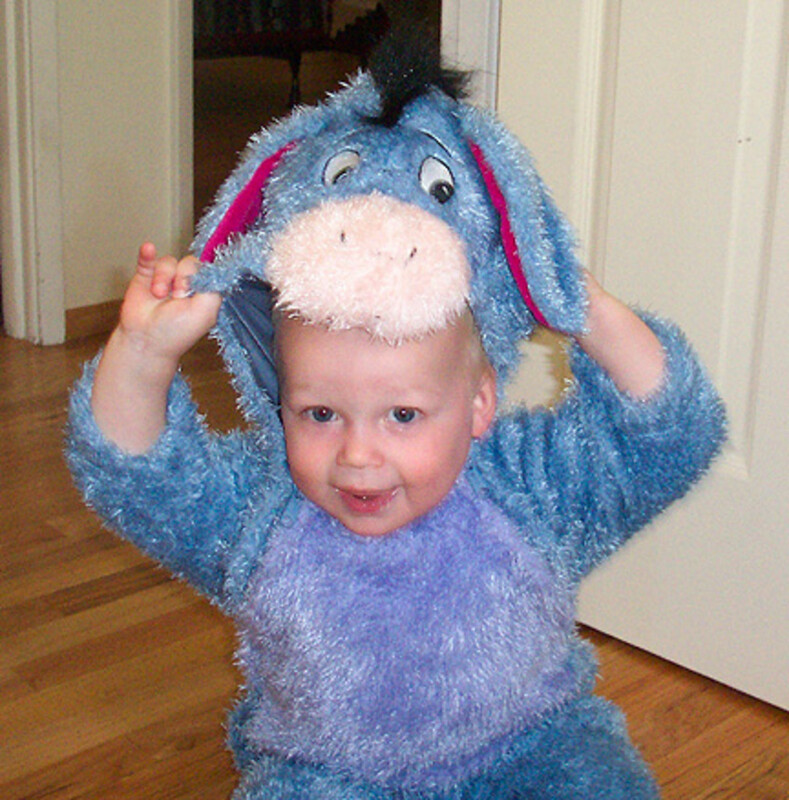 Here's a look at a toddler in an Eeyore costume, revealing why it is such a compelling choice for people of all ages. Of course catching him in an almost perfect pose doesn't hurt, adding to the terrific look. Again, the floppy ears and interesting eyes of Eeyore are a major part of what makes him who he is, and looks good in all of those costumes which include them. Let's face it, babies, toddlers and dogs are the funniest and cutest when wearing costumes, and that's no different with Eeyore, as seen by this funny picture of the dog showcasing himself as the donkey in such a mild manner. And when you look at the costume, you can see it wouldn't have been easy to get it on, so the dog must have been cooperating well, or it may not have been standing there so still for the photo. Again, those ears look fantastic. If you want to portray Eeyore, be sure the ears are the drooping type, as it is similar to someone's shoulders drooping when they're in a negative mood. Since Eeyore is part of the large group of Winnie the Pooh characters, that lends itself to going out together as a couple with a Winnie the Pooh theme, as seen below with Eeyore and Tigger. As for the Eeyore costume, this is how it should look in the sense of including the purple front and the rest of it blue. One thing though, Eeyore is made too smiley here, as it looks better when giving him a frown, as that's his usual demeanor, and it looks a lot more funny. Even so, this is a good example of putting your heads together to agree upon a couple of Winnie the Pooh characters to go out to a costume party together. 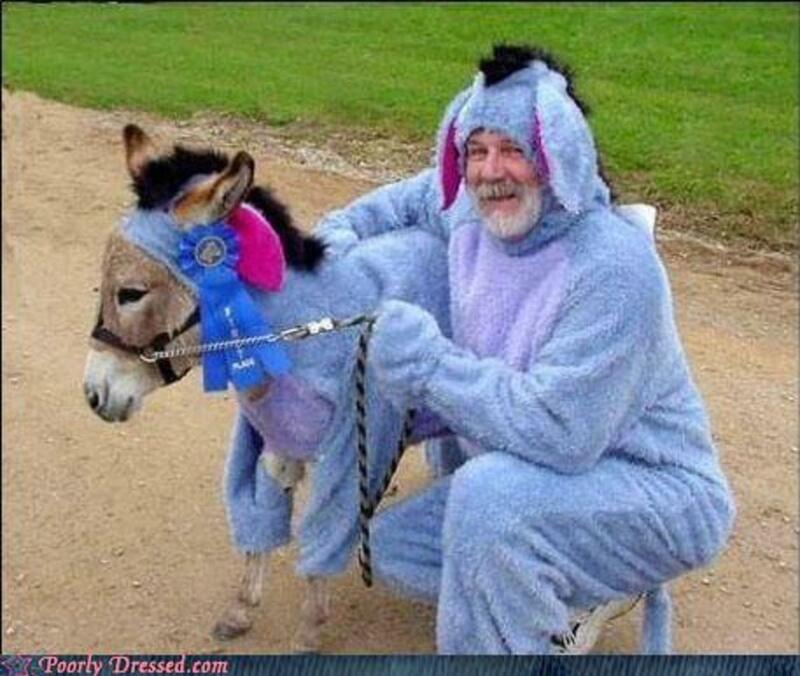 Now how funny is it to dress up a miniature donkey as Eeyore the donkey? Hilarious. What a fun idea. It's awesome to think of dressing up a donkey as Eeyore if you have one. 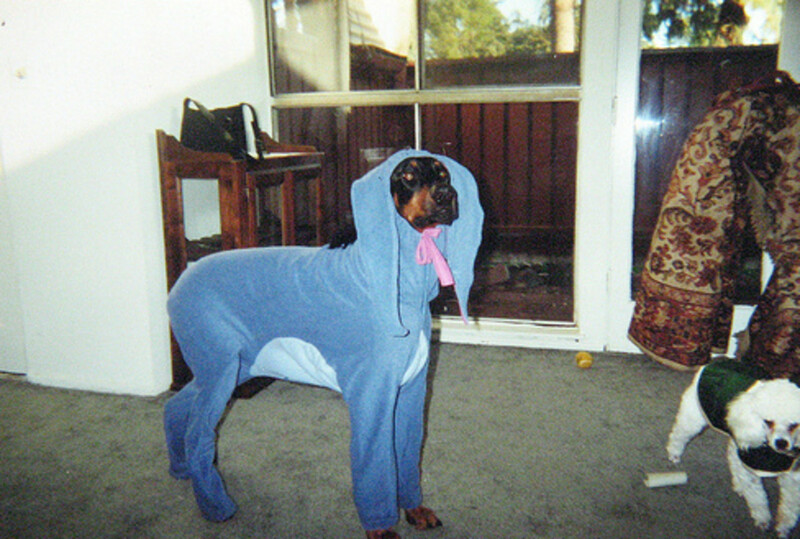 It's even better than putting your dog in an Eeyore costume. The irony of it is what makes this so funny, and wherever something like that would it in, it's certain it'll generate great laughs and comments from those appreciating the humor. It's amazing to see how Eeyore is used as a costume theme in so many ways. It's easy to see how you could go as a family of Winnie the Pooh characters, including your pets if they're the type that will cooperate with you. And of course going as a couple with different costumes is also a good option, as seen above. The bottom line though, is Eeyore is unique among cartoon characters, mostly based upon his unique personality and how most of us have been where he's at. 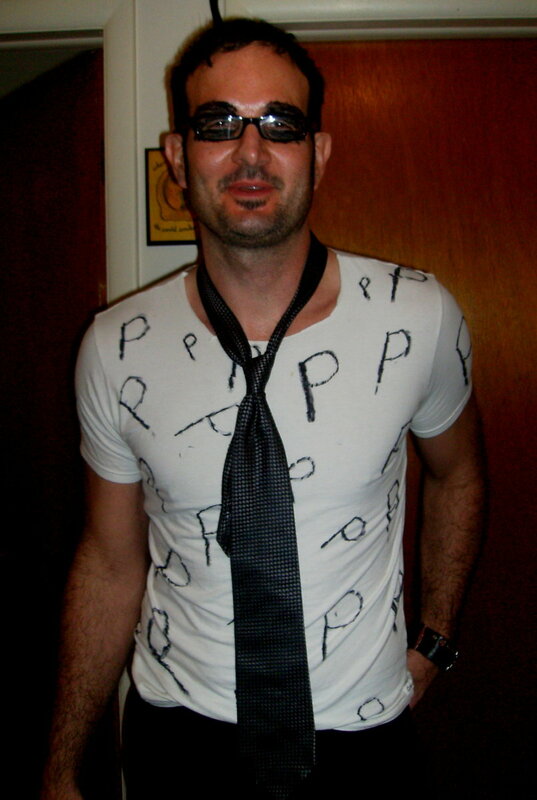 I think that, and the funny way he expresses himself is what makes him such a desirable character to dress up as. Remember, put together and memorize a few lines Eeyore could, would or has said, and you'll delight everyone with the look of the gloomy donkey, as well as some of his dry witticisms where he always expects the worst to happen.